Scott Wade was dubbed “Lord of the Dust” at an event in Istanbul, Turkey, and “the da Vinci of Dust” by the National Enquirer. Like many others with families to support and mortgages to pay, Scott Wade works full-time in an office cubicle, glued to his computer screen for a majority of daylight hours. But in his other life, cars are his art and dirt is his palette. Wade began doodling in filthy car windows as a way to relieve the stresses of his 9-to-5 job as a graphical user interface designer. He discovered a new meaning of “screen time” — one that involved intricate designs on windshields and 10-foot-tall storefront windows. 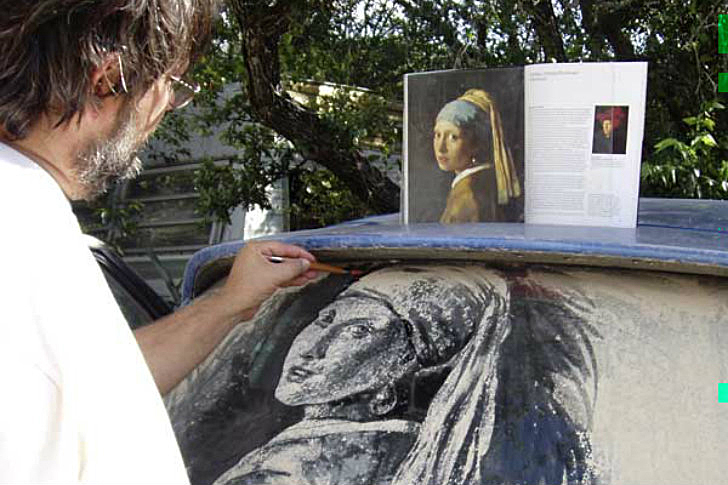 A hobby that began on small-town dirt roads in Texas evolved into the viral phenomenon of Dirty Car Art, bringing Wade to Lisbon, Istanbul, and London. But his toolkit remains simple: brushes and vegetable oil. “[My artwork] challenges our perceptions of what’s beautiful,” Wade explains in earnest. “It takes what we think of as an eyesore, and flips that on its head.” But like sidewalk chalk art and sand sculptures at the beach, impermanence comes with the territory. His masterpieces only last until the next rain. The dusty roads in Texas must make for ideal dirty car conditions. I used to live on a long dirt road, and the blend of limestone dust and gravel and clay resulted in a fine white dust that coated the rear window. My first 50 or 60 creations were on cars that got naturally dirty just from driving up and down that road, building up successive layers baked on by heat and humidity. And now? I don’t live on that dirt road anymore, and I’m doing a lot more creations for events. So I had to figure out a way to make a car dirty that wasn’t. I ordered Fuller’s Earth substitute — the same thing that makes dust clouds in the movies — and made it stick to the windows with a thin coat of vegetable oil. But I still love working on real dirty cars; they look much more three-dimensional. I miss those old days. Wade creates original drawings as well as representations of recognizable art, such as Girl with a Pearl Earring. What sparked your realization that a dirty rear window makes the perfect canvas? If you’re a fairly curious person, you can’t resist playing on a dirty car window, even if it’s just a smiley face or a “wash me.” It’s an impermanent canvas, so you’re free to play with it. It probably helped that you majored in art. I think I picked up drawing from my dad; he was a really good amateur cartoonist. Living on a mile and a half of dirt roads, we never washed our car, so I’d always doodle in the windows. Then, one day, I used my fingernail and a popsicle stick to do some cross-hatching. And then I went inside to get my brushes, and realized that I’d found a real medium. Your toolkit: A chisel-point rubber paint shaper tool, which acts like a pencil; different-sized fan brushes; and large brushes for the background. I do lot of work in Adobe Photoshop to figure out my designs, but the dirt is forgiving. 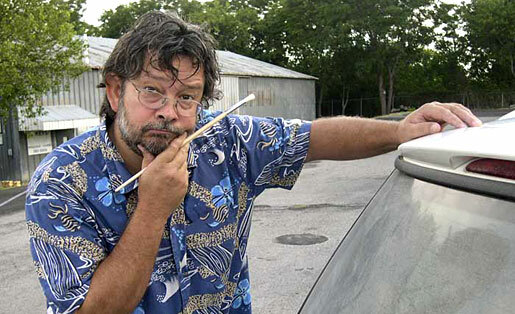 Do you carry the brushes with you for unsuspecting dirty cars? Sometimes, actually. That would be a great candid camera TV show: I could hang out at movie theaters, and when a really dirty car pulls up, draw in their windows. Since they’re at a movie theater, you know they’ll be gone for at least an hour or so. Your first drawing: A reproduction of the Mona Lisa with van Gogh’s Starry Night in the background. I sent it to some friends via email, and bloggers began linking to it. Then I got a call from the National Enquirer. And then your work went viral. Did that surprise you? Who would have thought people like looking at dirty pictures on the Internet? [Laughs.] I did receive some serious flack for a portrait of my daughter, which looked like she was being abducted. It was supposed to be funny, but it turned out creepy. Your dream dirt drawing: I want to do a portrait using someone’s cremated ashes on the windows of a hearse. It would be weird, but also compelling. Best part of your job: Most artists are isolated in their studios, but I’m creating artwork while people look on and talk to me. It took awhile to get used to, but I really enjoy that aspect. Most challenging part of your job: Dealing with the business side of things, which I think a lot of artists can relate to. The medium itself is also very challenging. Dirt is not uniform, and the results are never what I totally expect. What would people be surprised to learn about your job? A dirty car is typically an ugly thing. But when people see that dirt can be turned into beautiful art, it really challenges their perceptions. Best reaction to telling a stranger about your line of work: I always get a cocked eyebrow. I can tell they’re thinking, Oh, it’s probably just some little doodles. Then I show my representation of the Birth of Venus by Botticelli, and they’re totally floored. Do you wear protective gear to avoid breathing in dirt and dust? I might wear a paper mask, depending on the wind’s direction. When drawing on storefront windows, I wear goggles and a respirator. You mentioned the medium’s impermanence. How do you justify putting so much effort into something that the rain will wash off in seconds? It’s a lesson in letting go, in understanding that life is just a series of moments passing by. If you try to hang on to something, it causes grief and heartache. If you can just be happy you had the experience, it frees you up. One of Wade’s most recent works: The Marx Brothers. His creations can take anywhere from 30 minutes to 6 hours. Fee per job: I charge by the day, not by the car. My corporate rate is $3,500/day, especially overseas. My nonprofit rate ranges from $650/day to $1,200/day. When you tell your daughter to clean her dirty room, does she argue it’s just “art”? I don’t think she’s ever used that argument, and I’m not going to mention it to her. There are a lot of people who have made careers out of doing something special in their medium, like Julian Beever’s 3D pavement drawings. Be unique in the way you do art: that’s what gets attention. This type of work can be very rewarding and enriching. Click here for a full gallery of Scott Wade’s work. 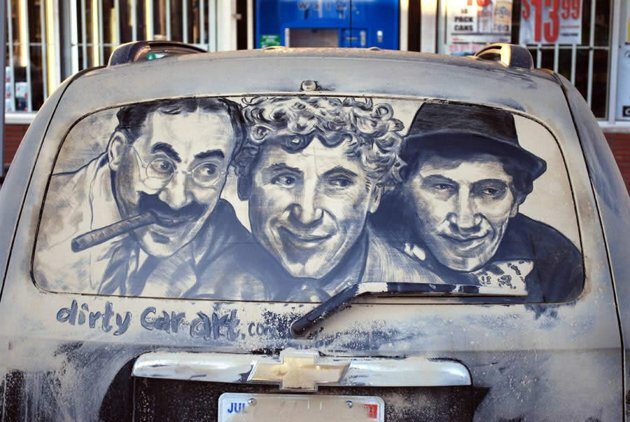 Impressed by dirty car art? For more artsy No Joe Schmos, meet the glassblower and the pop-up paper engineer. This entry was posted in Art and Design, Best Of, Cool jobs, Dirty Jobs and tagged 3d art, dirty car art, dirty jobs, julian beever, mona lisa, scott wade, starry night by Megan Hess. Bookmark the permalink.